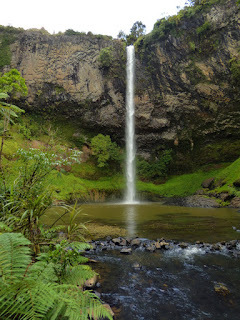 New Zealand's Bridal Veil Falls, North Island. 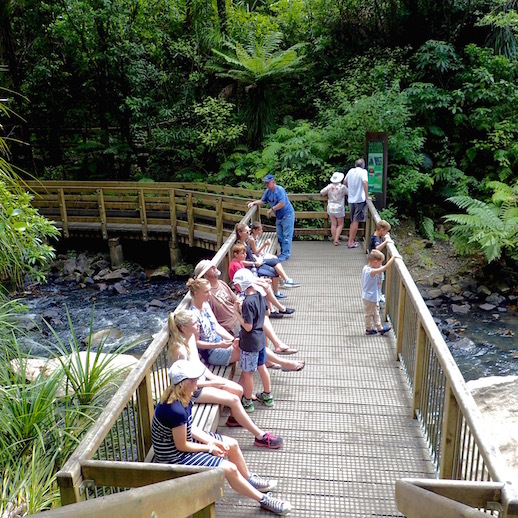 Who can resist an easy waterfall walk? Not us! Especially when we're looking for a respite and a gentle leg stretch as we bombed our way between New Zealand's Raglan (watch for a future post on that) and New Plymouth, both on New Zealand's North Island's West Coast. Bridal Veil Falls fit the bill perfectly, even if it seems to be one of the most common names for a water fall. Bit of a detour, but worth it. Falling 55 meters (~180 feet) is a respectably long fall. Wayne and me at Bridal Veil Falls midpoint. The trail with viewpoints above. midway, and below is well designed, with non-slip metal mesh covering over solid wood steps and sturdy hand railings. Its 261 steps from top to bottom were accomplished easily by families of all ages, speaking a smattering of different languages. While many New Zealand estimated trail times seemed to be more apt for athletic rather than average hikers, it really is easy to make it to Bridal Veil's base in 20 minutes, and about as easy back up. Bridal Veil Fall's base offers a sweet place to rest. It's a great place for a picnic. While we wolfed our sammies at the car before we started, we discovered there were a few picnic tables just past the trailhead, and there was also a great spot to stop at the base of the falls, too. We're currently road-tripping in New Zealand until February 8, 2016. 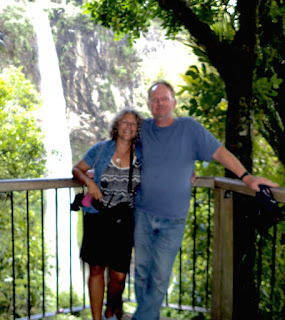 This post is about our travel in the area South of Raglan, North Island's West Coast. 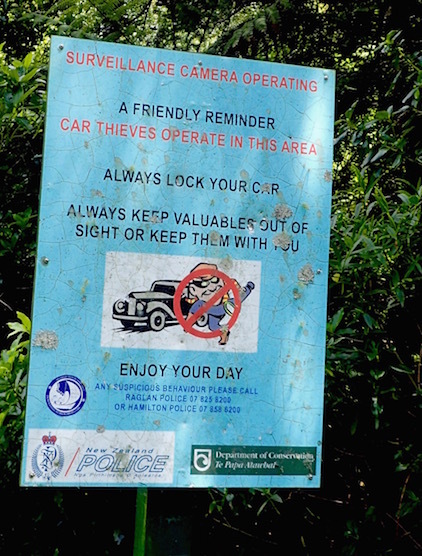 This catch-up post* was written in Wellington and set to post while we're in New Zealand's South Island, where we expect to spend about 2 weeks. Meanwhile our boat is in Whangarei's Town Basin Marina (S35.43.474 E174.19.599), moving to Riverside for haul out between the 1st & 2nd week of February. warned Bridal Veil Falls visitors. We took heed. Last year, between December 2014 and November 2015 we sailed from Florida USA to New Zealand. We will resume serious cruising when cyclone season ends in ~April 2016. Since arriving in New Zealand, November 21st, we've sailed less than 200 miles. Meanwhile, we've already put well over 1,000 kilometers on the car we bought just over a week ago.